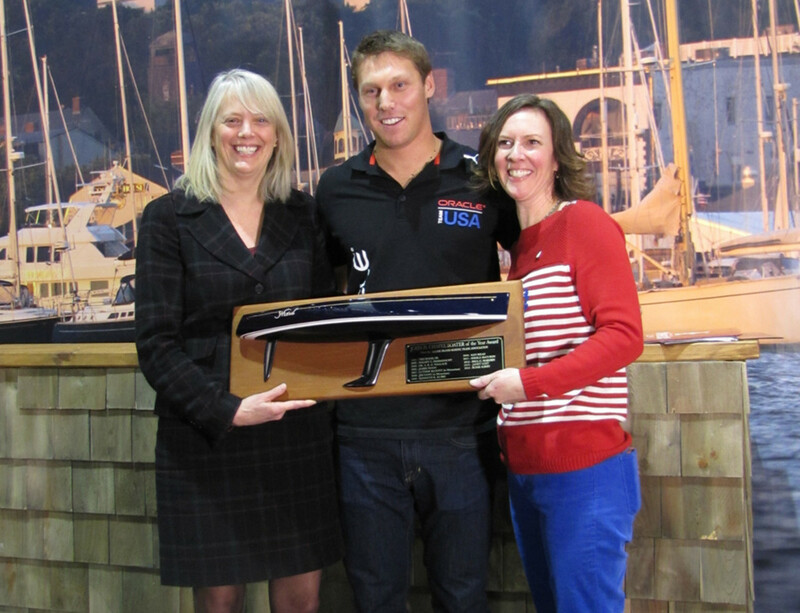 Rome Kirby, of America’s Cup champion Oracle Team USA, received the 2014 John H. Chafee Boater of the Year Award at the show. At left is Rhode Island Department of Environmental Management director Janet Coit, and at right is Rhode Island Marine Trades Association president Wendy Mackie. PROVIDENCE, R.I. — Rhode Island Marine Trades Association president Wendy Mackie wanted to beef up content at the 2014 Providence Boat Show, which ran from Friday through Sunday. Although the group had only owned the show for 100 days prior to the event, it made an effort to step up the content with interactive seminars and demonstrations. In addition, the association wanted to draw attention to the long and deep history the state has with sailing, a component that had all but disappeared at prior shows. “It really was a goal of ours to not only breathe some new life into the show, but to give people a flavor of what Rhode Island has to offer boaters,” Mackie told Trade Only Today on Friday at the show. Doug Wielhouwer, senior vice president at Eastern Yacht Sales in Hingham, Mass., said it was nice to see more attention paid to the sailing segment. The interactive events, such as the Surfset pavilion at the show, pleased some attendees. The demonstration, put on by FloorTime Studios of Middletown, R.I., featured surfboard simulators that are part of a growing exercise trend. Rhode Island native Rome Kirby, who is at age 23 was the youngest member of the U.S. sailing team Oracle, winner of the America’s Cup, received the 2014 John H. Chafee Boater of the Year Award from RIMTA on Friday afternoon. Kirby told the audience that the experience of being on the AC72 when it flipped “was scary.” Despite that, Kirby indicated that the Volvo Ocean Race might be more challenging than the America’s Cup race. Kirby also recounted some of the challenges of the come-from-behind win by the U.S. team. “We weren’t sailing that well to begin with, but we turned it around and got a bit lucky to not make a mistake,” he said. A demonstration that preceded the award ceremony featured sea-to-table fish preparation by the Ocean House, with no-heat fluke appetizers served with jalapeño, blood orange and other ingredients in an appetizer that attendees sampled. “I don’t like raw or cured fish, but that was really good,” said one attendee as she looked for another sample from the tray.